Looking for something warm, easy, and quick to serve during the winter holidays? 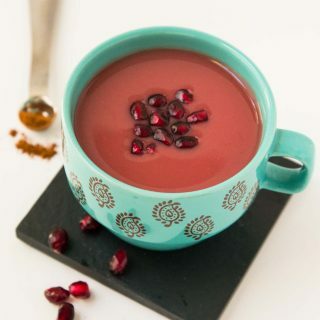 This Cinnamon-Spiced Pomegranate Juice Recipe will bring a warm sense of peace and relaxation! Completely blend the fresh pomegranate seeds, peeled orange, and apple with 1/2 cup water in a blender until completely pureed (I used my Vitamix for this). If you do not have a powerful blender, you may choose to strain the juice through a fine mesh to remove any pieces remaining, but since I used a Vitamix, this step was not necessary. Pour the pureed juice into a medium pot. Add another 1/2 cup water and cinnamon. Mix completely and heat the juice. Simmer on low-medium heat for 5-10 minutes until the juice becomes slightly thicker (depending on how thick you like your juice to be, this could take more or less time). Pour into mugs and enjoy warm! Store juice in the fridge and simply warm on stove when ready to serve. Since I used a vitamix, all the pomegranate seeds were completely pureed and the juice was completely smooth. If you find tiny bits of seeds still remaining, feel free to strain the juice through a fine mesh after blending.